At this time CORE Stage Company would like to say thank you for a wonderful past ten months! Over this time period we were able to produce our GALA, Schoolhouse Rock Live, A Christmas Carol, and - most recently - The Who’s Tommy!, all of which were shows we were proud to have our names on. The goal of the CORE Stage Company's production company has always been to be able to produce really strong non-equity theatre, and to give any actors and designers a quality place to work as they became the stars of tomorrow with a professional and educational feel. We believe we have been able to do that, and from the comments provided by our audiences, it appears they have felt the same. 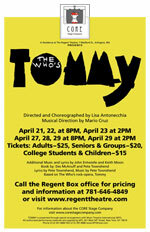 Our most recent production of TOMMY just closed April 29th, and had standing ovations that overwhelmed! The cast and crew were professional and a dream to work with. The performances grew and compelled audiences each and every night! We are elated this show occurred with such professionalism and thank all those involved for their efforts. It is at this time we would like to announce that CORE will be closing its doors for an undetermined period of time. Although a difficult decision, it is time to re-group before moving forward. This past year has been a dream come true and we couldn’t have done it without our Students, our Audiences, our Teachers, our Cast and Crews, and our Staff. We all have so much to be proud of! We take this moment to thank you for sharing in our quest and being in our CORE Family! We hope to see you again, but until then, keep supporting the Arts. It keeps us alive and enriches in so many ways!